1) Heat a pot of water over high heat. Add 1 teaspoon of salt and stir to dissolve. Cook macaroni in the boiling salted water for 10 minutes. Drain well and set aside. 2) Heat a large saucepan over low fire, melt butter. Stir in flour to form a roux, cook for 1 minute. If the flour added is too much to form roux, omit the 1-minute cooking time, just whisk in milk, in stages (a little at a time). Cook for 5 minutes till thickened and smooth sauce is formed. Whisk the milk solution in the saucepan constantly while cooking. 3) Add in all the cheese, continue to whisk to melt and combine well. By now, the creamy cheese sauce should be in thick and smooth consistency. 4) Return macaroni to the saucepan, and stir with small spatula to mix well with sauce. Sprinkle salt and stir well before heat off. Serve warm (May garnish with some coarsely grounded black pepper before serve). A portion of my cheesy macaroni counts about 350kcal. Expect more loads of calorie if using whipping cream instead of low-fat milk. 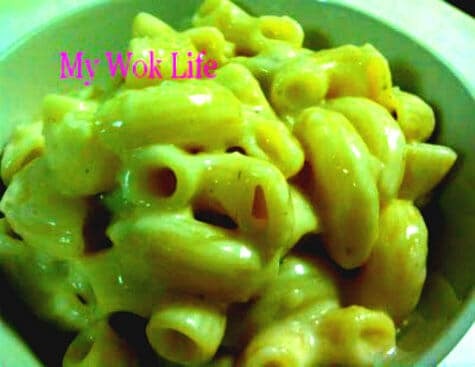 This simple Mac & Cheese recipe can be considered a vegetarian meal, if the vegan is not restricted to milk products in her/ his vegetarian diet. Extra toppings: Bacon bits, Chopped Italian herbs or Oregano herbs, Chili flakes, or sliced chicken fillet. To take a look on the photo of Mac & Cheese with extra toppings, sign in to my FaceBook fan Club now! Tips: Both whole milk and skimmed milk (preferably low-fat) are OK to be used in this recipe. * If do not have unsalted butter, use normal salted butter. Just adjust the adding of salt to suit your taste. Alternatively, use olive oil. * Dutch Edam cheese tastes smooth, sweet and nutty. This distinctive and delicious cheese is good to be taken for breakfast or to pair with a glass of Pinot Noir. Remember to peel of its outer layer of red wax coating before use. I got a large wedge of Edam (200 gram) and shredded it at home. The remaining was kept for future use. Edam cheese is available at major supermakets e.g. NTUC Finest, Cold Storage, and etc. It’s nice hearing from you again! Thanks for liking my recipe. I loved this macaroni too. You may find Edam cheese from NTUC Finest or cold storage.. I watch all kinds of cooking shows, too, but mainly Chinese cooking. I also attend culinary workshop from time to time.. Will let you guys knows if there is any good classes coming up..
And I know you and your hubby will love the Mac and Cheese. Do let me know again! Can you recommend what other ingredients I can add to this dish and can I also put it into the oven to bake it for a while? You may add diced ham or chicken fillet in bite size pieces, or top with bacon bits and chopped oregano or Italian herbs. Yes, after the listed steps in my recipe, simply add one more step by tranfering the macaroni into a baking dish. Then, put it into preheat oven to 175C and bake for 30min. However, you may want to first reduce the cooking time of macaron (in precooking step), instead of boil till thoroughly cooked, simply boil it till still-firm-to-bite texture, using only half the listed time in my recipe. thanks alot for sharing with me this recipe!! Have been really busy these few weeks thus no time to try but it does look simple enough for a cooking idiot like me!